A weekly newspaper has won its battle to get town status for an area of its patch. 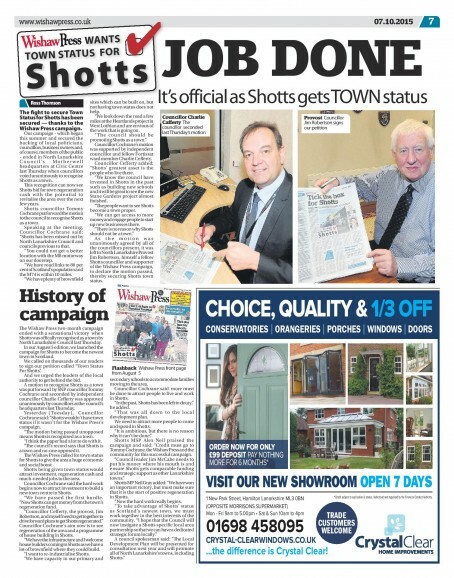 The Wishaw Press had been campaigning for Shotts to be recognised as a town for two months. North Lanarkshire Council has now agreed to the new designation for Shotts, previously a village, making it Scotland’s newest town. It means Shotts, which has a population of around 8,400, will be able to apply for a share of £1.7m being offered by the Scottish government to regenerate town centres across Scotland. The Press called on thousands of its readers to sign its petition called ‘Town Status For Shotts’ when it launched the campaign on 5 August. A motion to recognise Shotts as a town was approved by the council last Thursday. 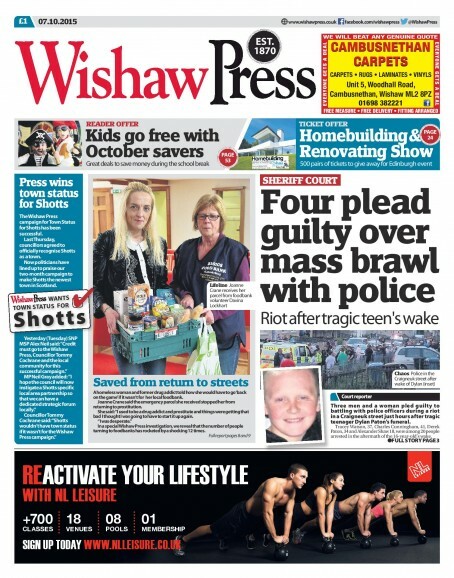 Cllr Tommy Cochrane, who proposed the motion, said: “Shotts wouldn’t have town status if it wasn’t for the Wishaw Press’s campaign. “The motion being passed unopposed means Shotts is recognised as a town. “I think the paper had a lot to do with it. The Press believes the new status will give the area a huge economic and social boost, attracting investment, regeneration cash and much-needed jobs to the area. Editor Gary Fanning said: “I am delighted that Shotts is the newest town in Scotland. “I am glad that the Wishaw Press played a major role in gaining town status for Shotts. “It shows the local community, local politicians and the local newspaper can work together to bring about change. Well done. But what a bloody awful mess of a front page. Smart but very cluttered. That Rockwell-style font has become the new Interstate I feel. The Wishaw press was great in supporting me to gain status for the largest community in my ward. Without the Wishaw Press involvement, it would have been kicked into the long grass again, as it was 3 years ago. So to Gary and his team massive thanks from my community and myself.